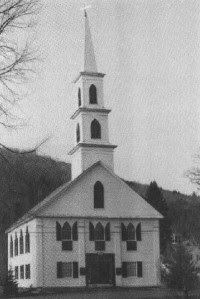 The church was first gathered on Newfane Hill, June 30, 1774, as the "Congregational Church of Christ," with nine members, including Jonathan Park, the first settler in Newfane, and Luke Knowlton, holder of the original town charter. Early histories indicate that the church met in the courthouse, but the courthouse was not built until 1787 when Newfane became the shiretown. The first minister was the Rev. Hezekiah Taylor who began ministering in 1774 and was officially "settled" by the vote of a Town Meeting in November, 1781. Mr. Taylor served as minister until 1811. At a town meeting in 1792, it was voted to build a meeting house, forty feet by fifty feet. The house was not raised until July, 1799. The pews were sold at public auction to pay for finishing the house. With the removal of the shire to Fayetteville, the congregational church also shifted. In 1832, they joined with four other Protestant sects to build the Union Church (now Union Hall). There were fifty-two pews. The pews were sold at auction. Each sect "had the pulpit" for the number of Sundays equal to the number of pews which they had subscribed. The Congregationalists had 20 Sundays, the Universalists 19, and the Methodists 13. In April, 1838, the Congregationalists decided to construct their own Meetinghouse in order to "secure the use and occupancy of the New Meetinghouse to the members of the Society and the control of the pulpit to the Congregational Church." The congregation changed its name to the "Orthodox Congregational Society of Newfane" in 1839. By September, 1838, the new Meetinghouse had been raised. The next year all the structural work was completed and nine sheds for parishioners' horses were built behind the church. The building seated 300 people and was built at a cost of $4000 plus many donated materials. It was dedicated on Sunday, October 2, 1839. The Congregational Meetinghouse underwent a major change about 1865 when the gallery was cut down and the "Desk" or Pulpit was altered. Historical records are sketchy, but this seems to indicate that the building was originally a single story structure with a main floor and gallery. With the gallery removed, the building could be divided into an upstairs place of worship and a downstairs area used for many different purposes. In 1875, the Ladies’ Aid Society was organized, and a Young People’s Christian Endeavor Society began in 1888. Ministry with young people has long since taken other forms, but the Ladies’ Aid is still a vital part of the life and work of the congregation. The choir was located in the back of the renovated upstairs worship space. In 1891, a platform was constructed adjacent to the rostrum for use by the choir. In 1897, slate replaced the wood shingles on the church roof and more modern pews were installed in the sanctuary. A furnace was put in the first floor of the church in September, 1904, in place of the old wood-burning stoves. 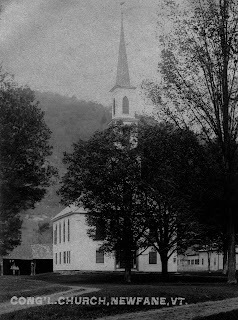 In December, 1914, the church was incorporated in the State of Vermont as "The First Congregational Church of Newfane." Also in 1914, electric lighting was installed. Prior to this innovation light came from kerosene lamps, with reflectors, placed in swinging brackets fastened well up on each window casing. In the middle of the auditorium was a large chandelier hung from the ceiling and carrying a cluster of oil lamps. During the summer of 1921, the church interior was redecorated through the efforts of the women of the church. The sanctuary of the building was completely refinished, including new lighting from Spain, in 1968. The congregation was a member of the Vermont Congregational Conference until the Congregationalists nationwide merged into a new denomination, the United Church of Christ, in 1957. First Congregational Church of Newfane became part of the United Church of Christ in 1976.